Possible to measure and record temperature of components and PWB with type K thermocouple. The dedicated software to link a station and a computer for easy and quick settings. A low cost SMD rework can be assembled with FR-811, dedicated software and options. ・Possible to make full-scale thermal profiles with 6-zone hot air and a bottom heater. A basic thermal profile is composed of the 5 parts shown above. FR-811 can provide 6 zones in which temperature, time, and air flow are controlled. 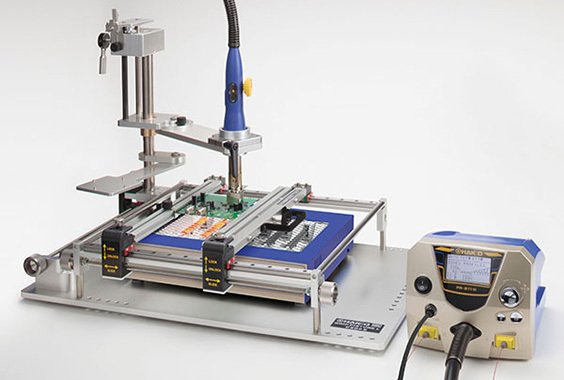 Therefore FR-811 can make a full-scale thermal profile which is close to reflow profiles made by a reflow oven. By connecting a thermocouple included with FR-811, the temperature of the component or circuit board can be measured and recorded. In addition, if "TC LINK" is set, the heater output can be automatically controlled so that the temperature of the thermocouple attached to the component or circuit board follows the set profile. In addition, the set values and graph can be saved in csv format. FR-811 can control on/off timing and output of the bottom heater, which is available optionally. 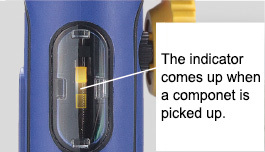 The vacuum pickup function is to pick up a component with a suction pad and vacuum. It will pick a component only after the hot air melts solder joints. This can avoid an error to peel off the land by removing a component with excessive force. Equipped with a high-visibility LCD to make it easy to check the various product settings or operation status. Indications are displayed using graphics as well as letters and numbers so information can be checked intuitively. The multi-direction control knob makes it easy to make and change settings shown in the LCD. There are several ways of knob movements, dialing, pressing, and tilting up and down and left to right for quick operation. A USB I/F terminal is available to link to a computer. 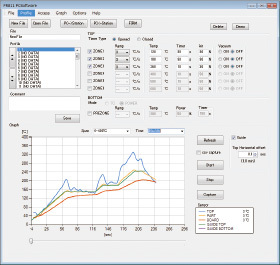 The dedicated software, which can display and record various settings or temperature data on a computer screen in real time, is included. Data can be transferred through a USB memory even without a computer. Nozzle can be changed quickly when working with a wide range of components. 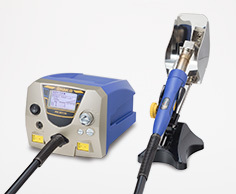 Conventional HAKKO nozzles can be used by using a special conversion adapter (option). Heater replacement is also simple.